As if the oil disaster weren’t enough, today is the first day of hurricane season. As Julia Whitty noted last week, hurricanes imperil the thousands of miles of oil pipelines that snake across the Gulf. 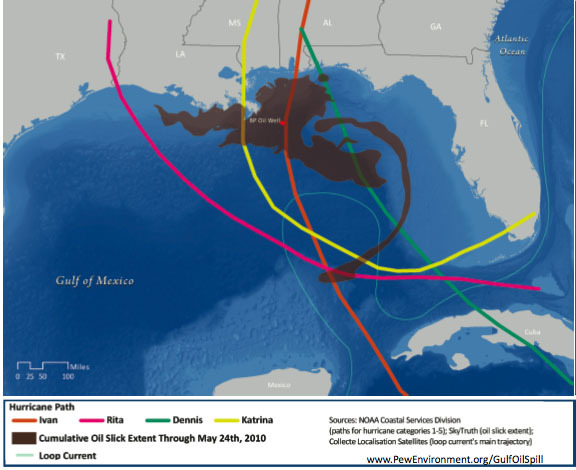 The storms also threaten to churn up the millions of gallons of oil in the Gulf, pushing the slick further on land and spreading it out over a larger area. Forecasters have predicted an above average hurricane season this year, which lasts through November. The National Oceanic and Atmospheric Administration predicts that 2010 will be an “active to extremely active” year. The agency forecasts between 14 and 23 named storms this year, and 8 to 14 of those will become hurricanes. Between 3 and 7 of those of those will qualify as major hurricanes—with sustained winds of 111 miles per hour or more. There’s a 44 percent chance of a strong hurricane hitting the Gulf Coast this year.